Turkmenistan has a long tradition of bulldozing neighborhoods and booting out residents to fulfill the president’s aesthetic impulses. A fresh look at years’ worth of satellite imagery shows that thousands of homes have never been replaced. Many neighborhoods flattened on order of President Gurbanguly Berdymukhamedov remain deserted fields. And the imagery confirms that the destruction continues despite widespread poverty and an economic crisis that regularly features breadlines. Where the displaced go is often a mystery. Ahead of the 2017 Asian Indoor and Martial Arts Games, the watchdog Amnesty International used satellite imagery to document the destruction. At the time some residents believed their neighborhoods were being swept away to make space to host the Games, a prestige project for the president that saw billions of dollars spent on new infrastructure. Sometimes residents are given only hours' notice to evict before the bulldozers arrive. Often they are not compensated. Protest is rare. Unapproved political activity is “brutally punished,” Human Rights Watch said this month. (The approved kind of political activity consists uniformly of young people in identical outfits waving flags for Berdymukhamedov). Eurasianet has partnered with the non-profit Earthrise Media to examine satellite imagery of neighborhoods in the capital, Ashgabat, and across Turkmenistan. The location and date for each image is visible in the sliders and videos below, and each subhead is linked to Google Maps. (If the sliders do not appear, check your browser’s privacy settings). In 2015 Berdymukhamedov’s Cabinet ordered this neighborhood of some 10,000 freestanding homes swept away to “fully implement the efforts of the esteemed President to place our capital among the modern and beautiful cities,” according to a letter to residents quoted by Amnesty. Choganly was one of Ashgabat’s so-called “dacha” neighborhoods – originally weekend homes that grew into full-time settlements, often with small gardens. Though in some cases there were questions about residents’ legal title, in others, residents have reportedly shown documentary proof that they own the land in question. Researchers and diplomats seeking clarity from government officials have met silence or obfuscation. Since the destruction of Choganly almost four years ago, nothing has risen. A reporter in Ashgabat says there is no information on plans for the district, though Choganly was mentioned in a state news report this month about Berdymukhamedov overseeing construction plans around the capital. It is unclear if the government plans to rebuild Shor – another “dacha” neighborhood – or where the residents went. This central neighborhood of small homes appeared after the 1948 earthquake and has seen scattered demolition since 2015. Unlike Choganly and Shor, however, Gaja is being redeveloped. Apartments in the new marble-clad apartment blocks, which a local resident described as “elite” housing, are mortgaged by government-run banks. Newer satellite images show not only that much of Berzengi has never been rebuilt, but that the destruction resumed under Berdymukhamedov. As this illustration shows, Berdymukhamedov stepped up the pace of demolition in this neighborhood and has overseen new housing construction. 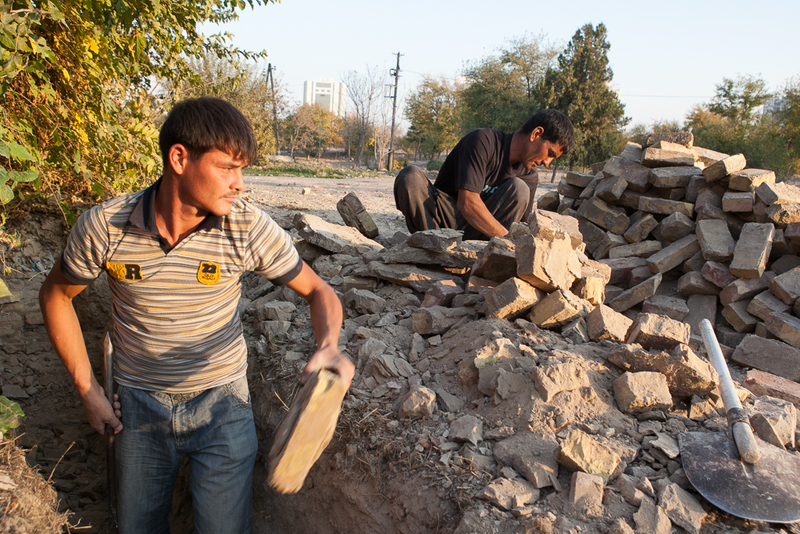 The devastation is not limited to Ashgabat. The Awaza beach resort on the Caspian Sea was one of Berdymukhamedov’s early pet projects. Previously Awaza had been a handful of brick holiday homes, but they were leveled to make space for glitzy, high-rise hotels, which visitors regularly describe as empty. The area to the south of the resorts was bulldozed, but never rebuilt. In this western suburb of Ashgabat the destruction happened for a very different reason, though the government’s reaction was similar. On July 7, 2011, Abadan was the scene of a massive arms-depot explosion that sent rockets flying into neighboring towns and flattened a large area. Some reports put the death toll over 1,000. The government said little. But it did jail a journalist for reporting on the blast. Special thanks to Dan Hammer of Earthrise Media for locating and illustrating the imagery in this story.